Fly Rod & Reel Magazine has partnered with Thomas & Thomas and is sending a 9-foot 7-weight Solar rod around the globe to catch as many fish as possible. Tarpon, permit, peacock bass, salmon, steelhead, dorado . . . . If it swims, we’ll throw at it with this stick and tell you what happens. In this installment Zach Matthews hits the Chattahoochee for big carp. Ten years ago my friend Andrew Wright and I sat in his garage discussing plans to pursue carp on Atlanta’s Chattahoochee River. We wanted to fish only one way: flats style. Two homebuilt Gheenoes, years of experimentation and a lot of life changes later, we found ourselves in a Mexican restaurant reflecting on what the last decade had taught us. How to pole, and then how to pole silently; tricks like packing the cooler with sponges to keep cans from rattling; flies that both land softly and head straight to the bottom; and most importantly, we’d learned how to find fish, especially carp, when the conditions make it seem impossible. When I got a call asking what local species would be best to catch with the Thomas & Thomas Solar 7-weight, the only thing I had to know was whether Andrew was in. Carp fishing is a team sport. 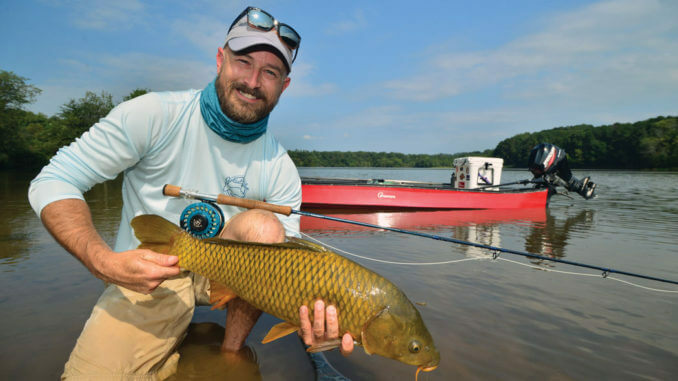 In late August, a transitional period for carp, we knew the flats conditions would be tough, and so they were. We logged 10 hours on the rod one Saturday, hit every spot we knew and finally had to admit defeat. Winds gusting to 20 miles per hour with a hard deck of cloud cover and opaque brown water forced us to admit that we couldn’t buy a shot. But we weren’t giving up. We met again the next day at 9am, with a narrow window of optimal light before the storms might roll in again. For about 15 minutes that morning everything lined up. With Andrew on the platform maneuvering the boat, we spotted two nice fish in clear, shallow water. It was classic flats fishing—the kind you can experience in Louisiana or Florida, on Christmas Island or, it turns out, near Atlanta. I made a cast and missed. I made another and missed again. My third try flopped in just right: 18 inches off the fish’s snout. The carp followed as Andrew urged me to keep the fly moving. Suddenly the fish darted slightly forward, the line straightened and the hook sank home. Ten minutes later we released the carp. You can try to buy an experience like that, but usually you’ll fail. The only kind of currency these fish accept is hours, and the price is always rising. You need two people, both dedicated to this style of fishing, to make it work. And you need a rod with the backbone to turn a carp when required. The Solar provided just that for me. That fresh, fishy taint on the cork handle smells pretty sweet. This article originally ran in the August 2016 issue of Fly Rod & Reel. 2 Responses to "Have Rod, Will Travel – Atlanta"
Sweet read my friend. And how the hell did you do that beautiful aerial? Looking forward to carping with you again sometime soon.